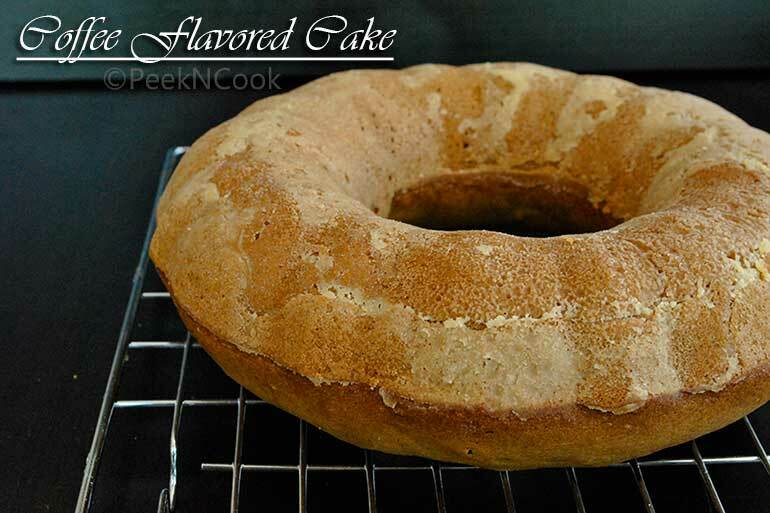 Coffee Flavored Cake is only for the coffee lovers. This cake will go well with tea or coffee or at breakfast of snack time. I was looking for its recipe many websites but didn't find the right one. So I tried this in my own style. I'm sure you guys will definitely love this recipe. Heat oven to 375F and butter a 10-inch tube pan. Mix the Flour, Baking Powder, Baking Soda, Cinnamon in a medium bowl, set aside. Beat the Oil and Granulated Sugar in a large bowl with an electric mixer set on medium speed until they mix together. Add the Eggs, 1 at a time, beating well after each addition. Add the Flour mixture with the Coffee and Instant Coffee Powder, beating after each addition until smooth. Pour the batter into the prepared pan and sprinkle chopped walnuts on it.Bake for 30-40 minutes or until a toothpick comes out clean. Remove the pan to a wire rack and cool for 10-15 minutes. Loosen the cake from the sides of the pan with a spatula and gently remove the cake to a wire rack to cool completely.